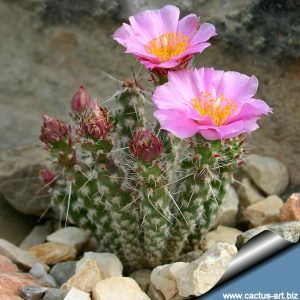 “Small Opuntia” making reference to the tiny size, the main feature of the genus. A genus of small low growing plants, strongly branched and forming clumps, with tuberous roots. Stems cylindrical, ellipsoid to clavate (with more or less prominent tubercles), usually erect, deciduous in the dry season. Areoles rounded having some grey wool, bearing tiny spines resembling glochids, and divergent spines somewhat flattened, the longest usually turned downward. Flowers diurnal, quite large, bell-shaped, appearing at the tip of stems, pink to purple, pollinated by insects. 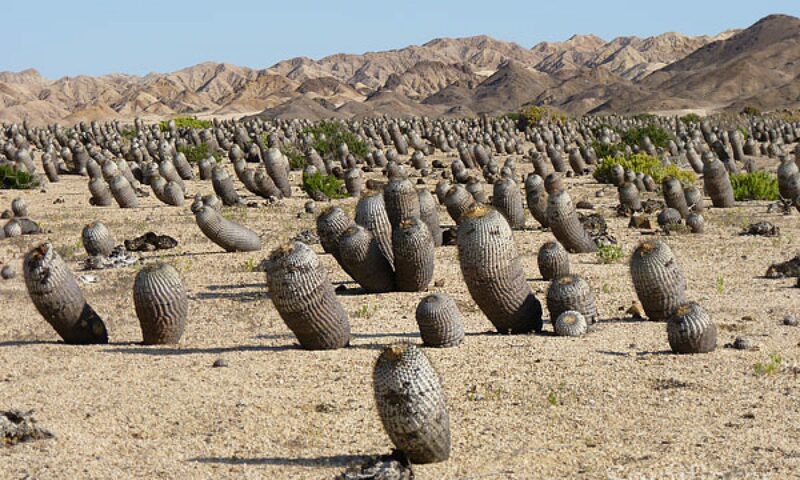 Fruits obconical, at first smooth and juicy, becoming dry. Seeds large, discoid, size and thickness variable according to species, whitish. Dispersal unknown. The genus Micropuntia grows in deserts, on rocky acid soils, among grasses, from 1200 m up to approximately 1900 m in altitude. It is also found on plains, sand dunes in dry river beds (M. pulchella), while other taxa grow on low sloping hills, among thick bushes. USA (N. Arizona, California, Nevada, Utah).